A traditional tart recipe that couldn't be easier to make. Follow our step-by-step guide and you'll be on your way to making a magnificent baked chocolate tart in minutes. 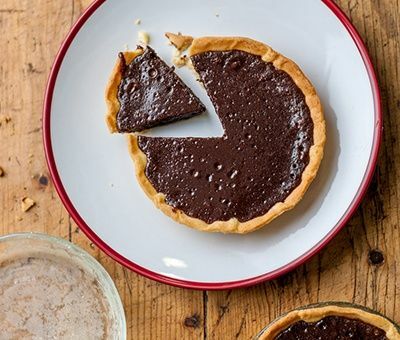 Our chocolate tart recipe is a great dessert to wow your friends at dinner parties. Preheat oven to 200°C (180°C with fan) Gas mark 6. Line a tart dish with the pastry and blind bake for 10 – 15 minutes till cooked and beginning to turn golden. Remove from the oven and allow to cool before removing the baking beans. To blind bake: Lightly grease a tart case then line with a thin layer of pastry. Cut a circle of baking paper an inch larger than the tart. Line the pastry with baking paper and then fill with baking beans; this will weigh down the pastry as it cooks. Bake until cooked and turning golden round the edges. Turn the oven down to 160°C (140° C with fan) Gas mark 3. Add the Carnation caramel, chocolate and eggs to a bowl. Mix gently until smooth (avoid making too many bubbles) and pour into the tart case. Place in the centre of the oven for 25-30 minutes or until the filling is set and starting to rise. Remove and allow the tart to cool completely before cutting. For a shortcut baked chocolate tart, use a pre-cooked pastry case and skip straight to step 3. I made this and I'm over the moon with the results. Very easy and tast lovely. Can you make this with the caramal one too? Hello Clare, this recipe is wonderfully simple, the secret is the Carnation Chocolate. Maybe give Quick Banoffee Pie a go if you want to use Carnation Caramel? Baked Chocolate Tart Recipe is rated 5.0 out of 5 by 3. Rated 5 out of 5 by Shizling from Terrific! I love chocolate tarts and this one was truly decadent! Love the consistency and the flavour. I usually make it with a chocolate base, though! I’m sure it tastes great this way as well! The filling is just heaven!